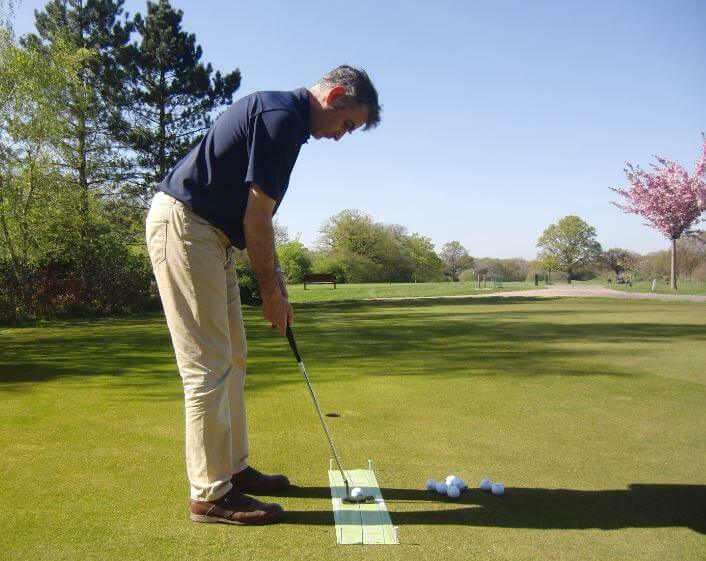 Developed by PGA Professional & Putting Consultant Andy Gorman, the ‘T-Stroke Putting ARC’ mat illustrates the ‘natural’ movement the putter head and face make during the stroke. Made from tough vinyl and supplied in a tube to be keeping it smooth whilst in your golf bag, the mat is waterproof and durable allowing it to be used anywhere, indoors or out on the putting green! Simply place the ball on one of the illustrated balls in the middle of the mat. Align your putter squarely to the target-line, and move your putter back and forward, maintaining the sweet-spot of the putter on the black ‘ARC’ line. The correct face rotation is indicated by the black & green lines perpendicular to the arc line. Use tees in the holes either side of the target-line for accuracy training & practise back & forward stroke lengths, black-to-black, green-to-green for tempo training. The ARC stroke doesn’t require the golfer to get their eyes over the ball, and positions the golfer in a relaxed/natural position at address and during the stroke. Use a tee in the hole at the end of the target-line behind the ball and find your ideal target line, once located, place two more tees in the front corners to secure on the green. The T-Stoke Putting ARC mat is an approved putting stroke trainer by SeeMore Putting Company, the largest Independent Putter Manufacturer in the World. Used by numerous players on the both Men’s & Ladies European Tour; 2013 Wales Open Champion, 2014 LET Lalla Meryem Cup Champion, 2013 Solheim Cup players and an increasing number of coaches on the PGA and European Tours.